Independence Conservancy works to safeguard natural resources in our own back yard - green space and clean water - for future generations. With the help of our members and partners, we have achieved over $1.5 million of environmental reclamation and land preservation since 1999. Please help us continue to protect and restore the Raccoon Creek Region. Your contact information is private and will not be shared or sold. Thank you for your support! The Independence Conservancy is a watershed-based land trust founded in 1999 in Aliquippa, PA. We are an all-volunteer group of environmental enthusiasts who share a vision of clean water, beautiful vistas and special places in the Raccoon Creek Region preserved forever. 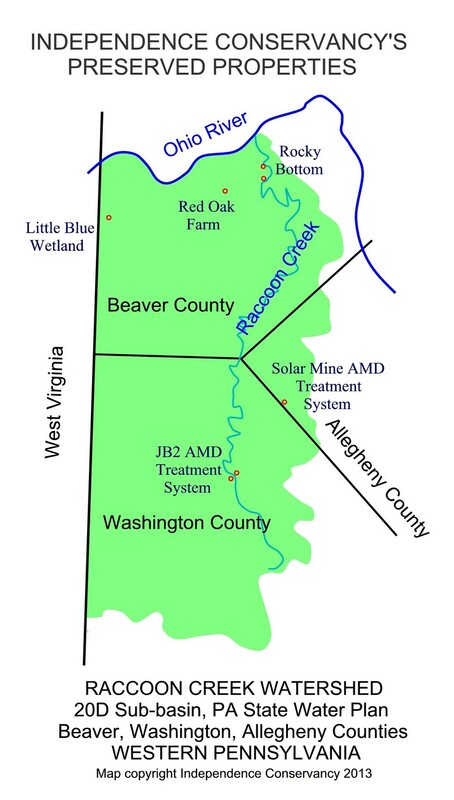 We are a 501(c)3 Pennsylvania nonprofit watershed organization that has gone the extra mile toward long-term protection of our local natural resources by adopting land trust Standards and Practices. Land trusts are private, nonprofit organizations that work cooperatively with landowners to protect and conserve land for its natural, recreational, scenic, historic, or productive value – values that sustain life on earth. Independence Conservancy works with local governments and other nonprofits to protect clean water and green space in the Raccoon Creek Region. How? Learn more by clicking on the Raccoon Creek Greenway, the Rocky Bottom Public Access Project, the Community Tire Collection Program and more News & Projects. Educating people about the function and values of wetlands.